This guide will help you expose RESTful API using a combination of Spring Boot, JPA/Hibernate, Spring Data and Spring Data REST. We will use H2 as the in memory database. How to create a project using Spring Boot, Spring Boot Starter JPA, Spring Boot Data Rest Starter and H2? How to expose RESTful API using Spring Boot Data Rest? How to connect a Spring Boot project to database using JPA/Hibernate? How to create a simple JPA Entity with a primary key? How to write a simple repository interface extending JpaRepository interface? Student.java - Entity bean to store student details. StudentDataRestRepository.java - Extends PagingAndSortingRepository. Acts as a @RepositoryRestResource to provide RESTful API/Services to update/retrieve Student entities. data.sql - We use data.sql to populate the initial student data. 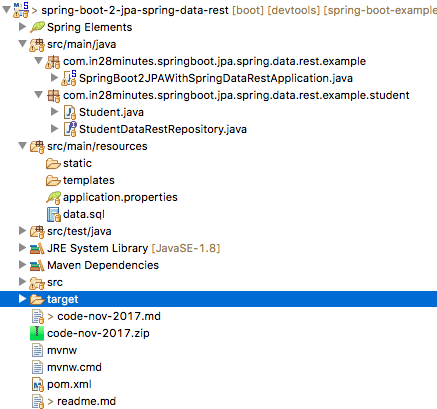 SpringBoot2JPAWithSpringDataRestApplication.java - The main Spring Boot Application class which is used to launch up the application. pom.xml - Contains all the dependencies needed to build this project. We will use Spring Boot Starter JPA, Spring Boot Data REST Starter and Spring Boot Starter Web other than Developer Tools and H2 as in memory database. Big Picture - How does Spring Data REST Work? Let’s start with JPA before moving onto Spring Data and Spring Data REST. JPA allows to map application classes to tables in database. JPQL (Java Persistence Query Language) - Provides ways to write queries to execute searches against entities. Important thing to understand is the these are different from SQL queries. JPQL queries already understand the mappings that are defined between entities. We can add additional conditions as needed. Criteria API defines a Java based API to execute searches against databases. Spring Data’s mission is to provide a familiar and consistent, Spring-based programming model for data access while still retaining the special traits of the underlying data store. It makes it easy to use data access technologies, relational and non-relational databases, map-reduce frameworks, and cloud-based data services. To make it simpler, Spring Data provides Abstractions (interfaces) you can use irrespective of underlying data source. You can define a simple repository and use it to insert, update, delete and retrieve todo entities from the database - without writing a lot of code. Spring Data REST can be used to expose HATEOAS RESTful resources around Spring Data repositories. Without writing a lot of code, we can expose RESTful API around Spring Data Repositories. The response contains the href of the newly created resource. Do not forget to add the dependency on “Rest Repositories” i.e. Spring Boot Data Rest Starter. Below is the list of starter projects in pom.xml. 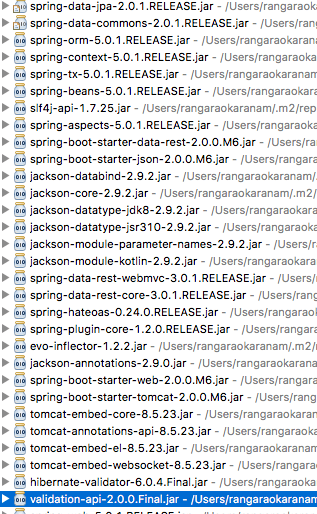 Below picture highlights some of the dependencies that are part of the imported Spring Boot project. Key Question : How did all these dependencies come in? Extract below shows some code from pom.xml of spring-boot-starter-data-rest. We will use H2 as the database. H2 provides a web interface called H2 Console to see the data. Let’s enable h2 console in the application.properties. When you reload the application, you can launch up H2 Console at http://localhost:8080/h2-console. 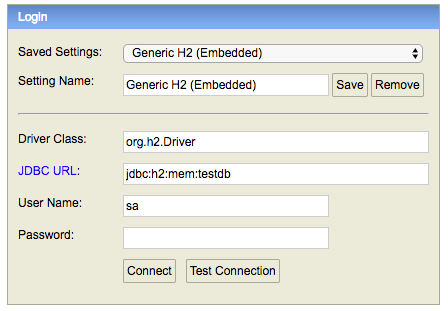 Tip - Make sure that you use jdbc:h2:mem:testdb as JDBC URL. When you use the right JDBC URL given above, you should see an empty schema when you click Connect button. The first step is to create a JPA Entity. Lets create a simple Student Entity with a primary key id. @Entity: Specifies that the class is an entity. This annotation is applied to the entity class. @Id: Specifies the primary key of an entity. @GeneratedValue: Provides for the specification of generation strategies for the values of primary keys. When the application reloads, you can launch H2 console at http://localhost:8080/h2-console. You will see that a new table called ‘student’ is created in H2 Console. How did the Student table get created? Its because of Spring Boot Auto Configuration. Let’s now populate some data into the student table. When the application reloads you would see following statements in the log indicating that the sql files are picked up. 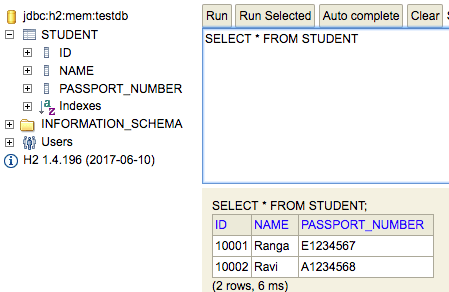 After App Reload, When you login to H2 Console (http://localhost:8080/h2-console) you can see that the student table is created and the data is populated. Code below shows the Spring Data Rest Repository to expose API around the Student resource. When the application reloads, you would see that there are a number of new statements in the console log. As we can see a number of URIs with varied request methods are exposed by Spring Data Rest. In the next section, we will explore all these resources. In this section, lets look at some of the Resource URIs that are exposed by Spring Data Rest. _embedded - Details of all students are part of this JSON element. _links - This section contains the links to other related resources - HATEOAS. page - This section contains the details of current page if we are using pagination. For example - http://localhost:8080/students?page=1 (0 indexed) will retrieve the second page of results. In this case, the page will be empty. Support for sorting - http://localhost:8080/students?sort=passportNumber : Sort by passport number. Ravi would appear in the results before Ranga because his passport starts with “A”. When we execute the above request, a new student is created. The response contains the URI to the created resource. Response Status - 201 CREATED. When we execute the above request, details of a student are retrieved. When we execute the above request, student details are updated. The response contains the URI to the updated resource. ALPS is a data format for defining simple descriptions of application-level semantics, similar in complexity to HTML microformats. An ALPS document can be used as a profile to explain the application semantics of a document with an application-agnostic media type (such as HTML, HAL, Collection+JSON, Siren, etc.). This increases the reusability of profile documents across media types.